Many collectors ask for glassware, pottery and china identifications. From verbal descriptions, it's often hard to figure out what you have but with a photo, everyone gets a chance to see the item, maybe do a little research, and benefit from the expertise of others. All help is welcome -- and if you can provide a documented ID, you'll get the credit right here! So, here's the drill: Please e-mail a photo to glass-pottery-id@mindspring.com with as much information as you can. I prefer smaller photos, but not so small that the detail is lost. File size should not exceed 75KB. I'll do my best to place the photo on this page as quickly as possible. If you have any questions or suggestions, please let me know. 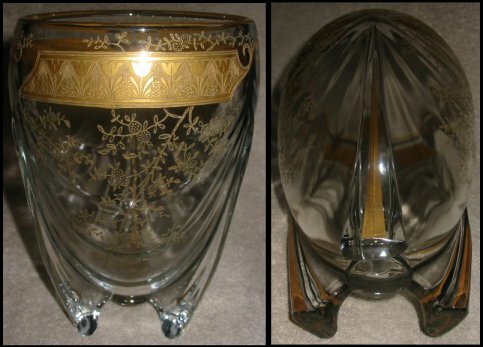 Crystal etched vase: Ron asks about maker and pattern of this etched crystal vase with gold band. Instinct tells me Tiffin, but I can't identify the etch or the gold band's tulip motif. Any ideas? 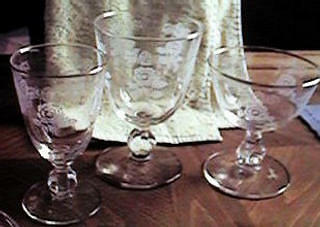 Crystal goblets: Margaret is trying to identify a set of crystal goblets that belonged to her mother. She writes: "This is the smallest of a series of three sizes. 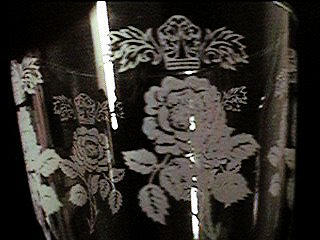 The stems are cut glass, as is the pattern. They were purchased at Marshall Field's in Chicago, probably in 1940 as we went to war. My mother always said they came from a European country and we could not get any more because the factory was destroyed in the war and was not rebuilt." Can someone identify? 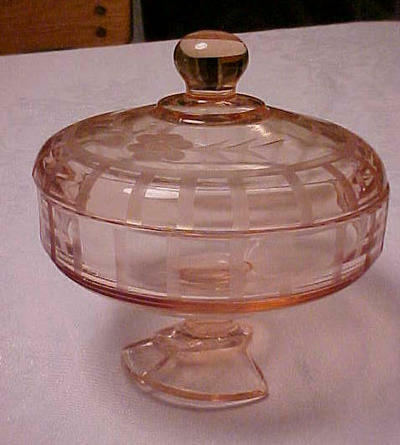 Pink compote and plate: Marianne offers photos of an octagonal pink compote (or mayo?) 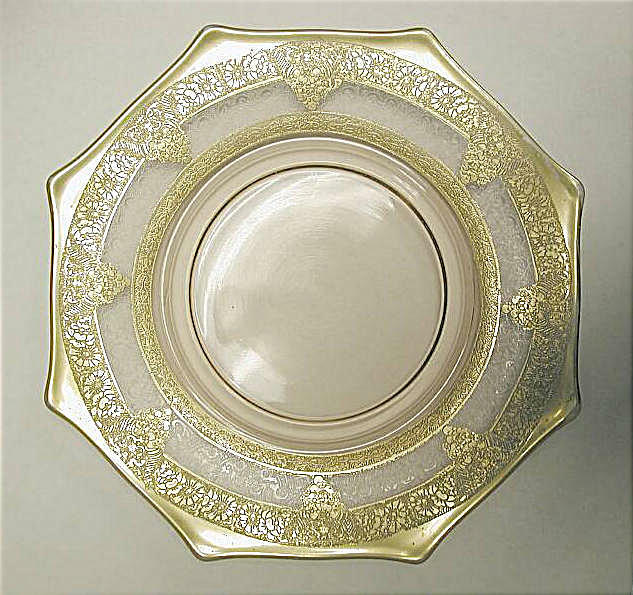 and 7.5" plate whose etched design is heavily gold-encrusted. The compote stands almost 7" tall. I think the set may be Paden City -- what do you think? Crystal goblet: Despite the photo's purple overtones, this goblet is crystal, with a smooth, unetched bowl, and the stem ribbed and cut in a teardrop shape. The owner, who says her mother-in-law's goblets were packed away in 1973, asks, "Do you know who the maker is, how old they might be, and if they are still available?" Karen M. identifies this stem as "the D-3 blank of Duncan Miller, used for various cut patterns, but uncut [it] was called Duncan Phyfe. The "Tiffin Is Forever" reference book by Bob Page & Dale Frederiksen has a line drawing of the stem on page 17. 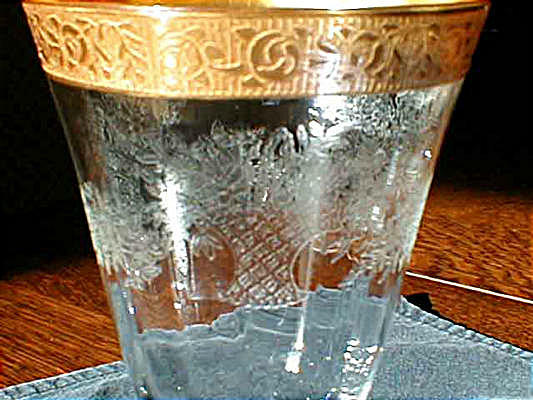 An actual photograph of the stem can be seen on page 119 of Fred Bickenheuser's "Tiffin Glassmasters Book III". I'm not sure about the date of manufacture; US Glass bought Duncan Miller around 1956 and operated the division out of Factory R (Tiffin)." 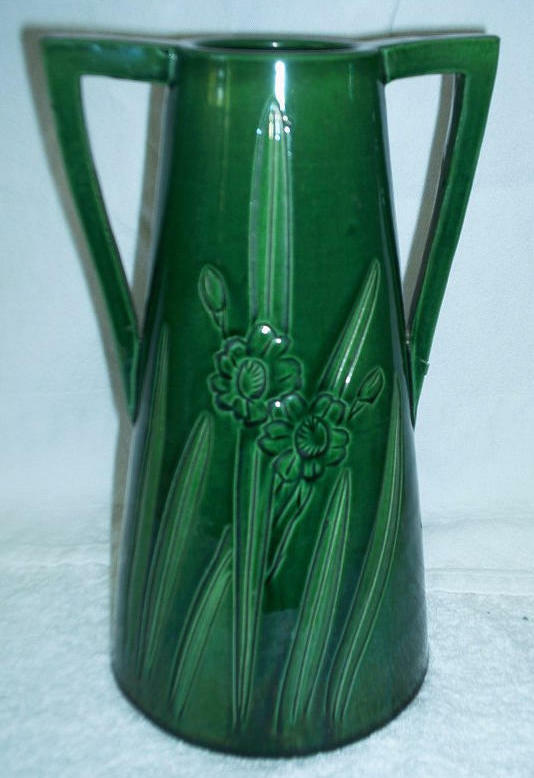 Green pottery vase: Sandra's vase is 9.5" tall, 2" across mouth opening, with 5.25" long handles. Decorated with raised flowers and leaves, the vase is marked Japan on the bottom; the mark has a square with another square inside with horizontal lines in it. 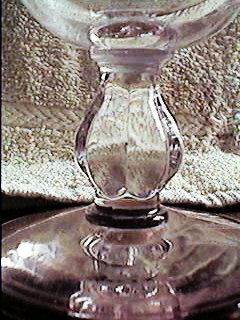 Purple glass stopper: Connie wonders if this large stopper is Blenko, and what type of decanter it matches. 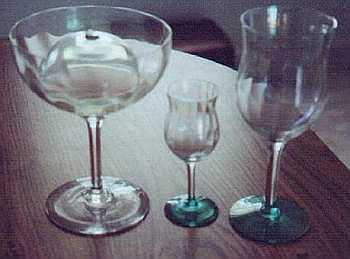 It is about 9 to 9.125" long and 6.25" at its widest point; the part that goes into bottle measures 2.25". Green decorated punch bowl: Ben would like to know the pattern name, maker and dates of production for this punch bowl and cups. He describes the pattern as "a five-point leaf with thin vines or tendrils shooting from it. 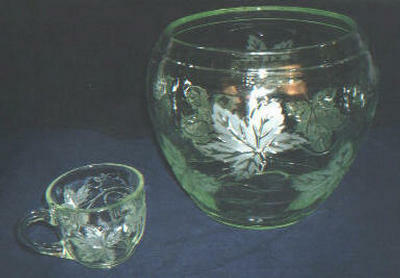 The leaf itself is frosted or etched in appearance and is raised in relief off the surface of the glass. The tendrils are also raised but not frosted. 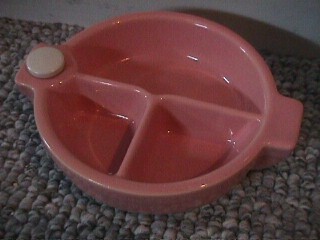 The inside of the punchbowl and cups is smooth, i.e. the relief does not originate from inside the punch bowl. The color of the glass is light green but does not have the 'vaseline' or luminous quality of some green Depression glass. The glass does have a small bubble within it here and there, and there is also a straight vertical mold line barely visible on each piece. The glass is thick and heavy." Has anyone seen this punch set before? Art glass? Fostoria? Sean "thought this was just some art glass bowl, but a friend says he has it in green and feels certain it is Fostoria when they decided to try modern." So who's right? 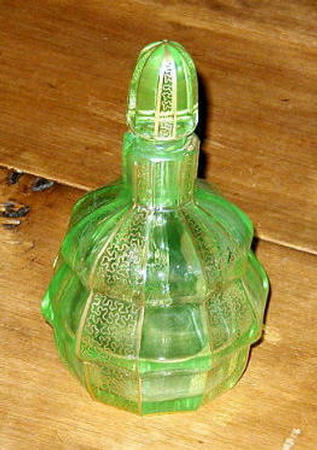 Green decorated bottle: Jan and Don would like to know more about this "interestingly shaped bottle and stopper of green glass and gilded with gold. The bottle with stopper are 6-1/2 inches high. 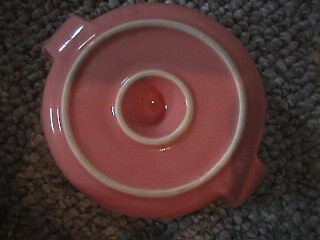 The diameter of the bottom is slightly less than 3". 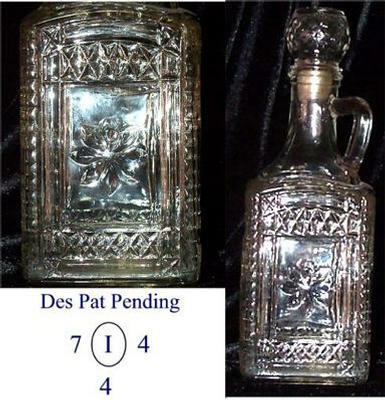 At its widest the bottle is 4" across." Pink covered compote: Alice's broken pink compote is etched with a checked pattern and flowers. It is pressed glass and about 9" across and high. A matching bonbon is a recent eBay find; Alice would like to replace the compote and locate additional pieces but does not know the maker or design. Any ideas? 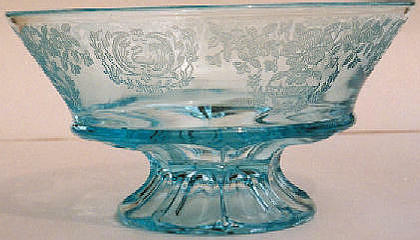 Co-author of the new book, Paden City Glassware, Debbie Torsiello identifies the compote as "made by Paden City [with] one of the wonderful wheel cutting designs on it." Paden City's pale pink color is known as Cheriglo. Tiffin stem: Linda's research leads to Tiffin's Minton. 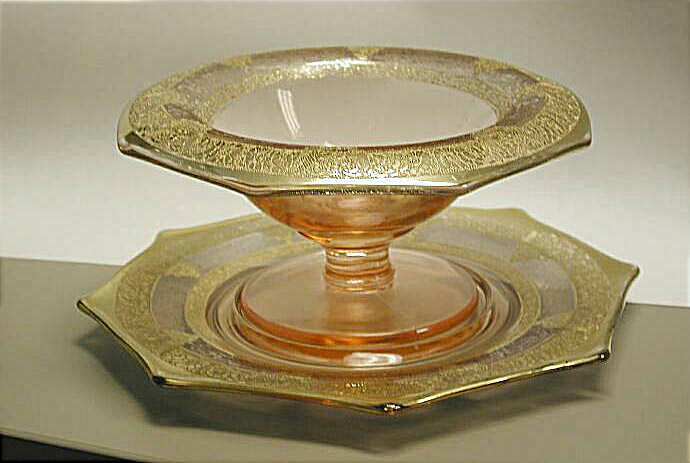 Same stem #14196 with gold-encrusted crystal optic bowl but the rim design is Rambler Rose (Tiffin Is Forever, p. 37). Page & Frederiksen's book, however, does not show the etch - a basket or vase of flowers. Does this change the name from Rambler Rose to something else? 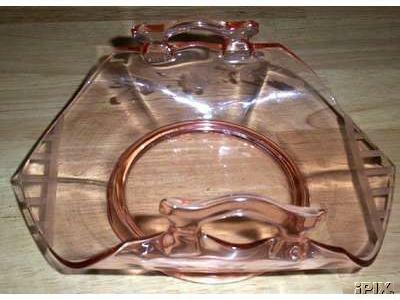 Pressed glass square decanter: Cheryl needs help in dating this pressed glass decanter, whose marks are reproduced in the photo. The words Des Pat Pending appear above the marks. The square decanter has a flower in the center of each square and a raised diamond pattern. Corners are rounded and have a design of either squares or incised lines. The stopper repeats the same diamond shapes with a flat head, which also has a design. 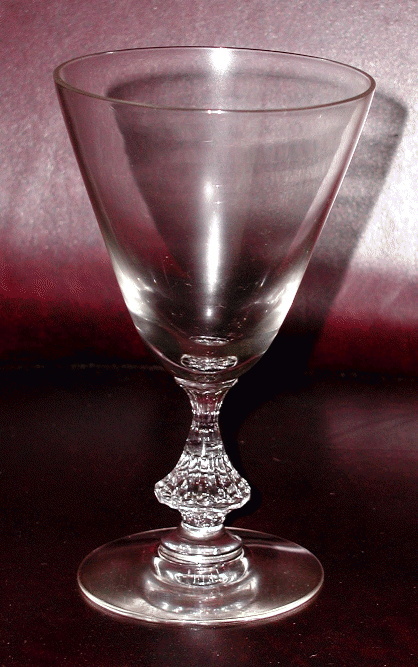 Crystal floral-etched goblet: Anita is looking for replacement stemware to match this crystal goblet; the pattern has been in her family for years. She believes the glasses were purchased in the 1940s in Duluth, MN. There are no identifying marks on the stemware. Each goblet stands 7-7/8" high; the diameter of the bowl is 3-1/2" and that of the base is 3". A pattern of daisies and buds -- stem with daisy, 4 buds, and leaves -- repeats 3 times. 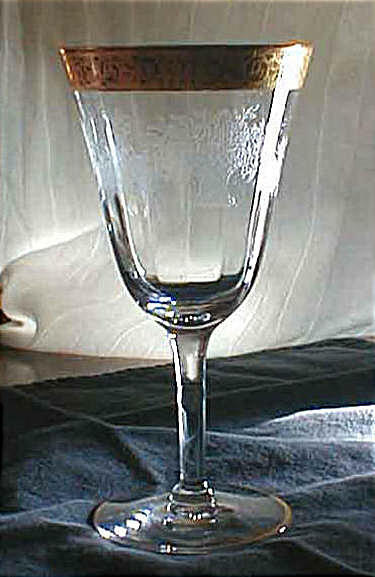 A bevel runs vertically that can be felt on the inside of the glass. Canadian art glass: I've had two inquiries about Seetusee Glassware by Mayfair, which as far as I can tell is contemporary art glass out of Portage-la-Prairie, west of Winnipeg, Manitoba. Colors are vivid, and a distinguishing feature is that each piece is "sealed with pigskin." 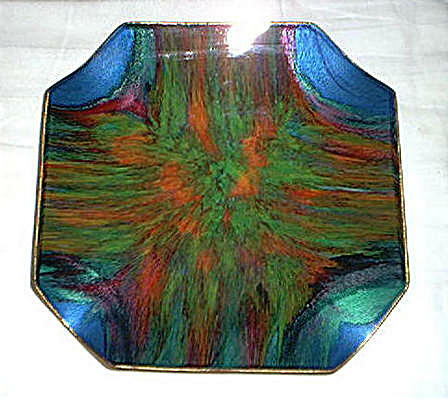 Cari offers a photo of her yard-sale find -- a plate or tray of red, green, blue and purple in an irregular octagon shape. 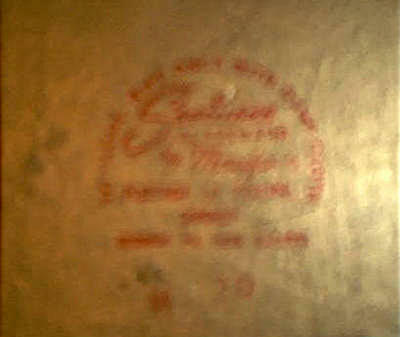 The backstamp reads Seetusee Glassware by Mayfair, Portage-la-Prairie, Canada, with the number M 70. When perusal of 4 search engines yields only references to eBay auctions (porcelain!) and an inquiry in my own Guestbook -- well, now it's time to locate Seetusee collectors and find out more about this colorful glassware! Crystal relish tray with gold: The floral detail of Nancy's 5-part celery tray (or relish) reminds me of Cambridge Portia, but it isn't. Can anyone identify the maker and design? David Adams of Our House Antiques has come up with documentation to identify this piece as Cambridge with a Lotus Glass Company decoration called "Bridal Bouquet." A 1944 catalog page shows the No. 301 12" 5-compartment relish and a number of other items with the same decoration. 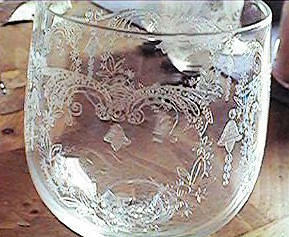 "Bell" Etch Crystal: Karen has submitted photos of several patterns for identification. 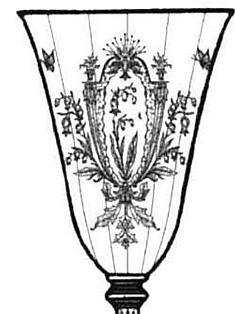 First is a design whose motif contains a small "bell"; the stem is faceted and has panels similar to those found on Imperial glassware. 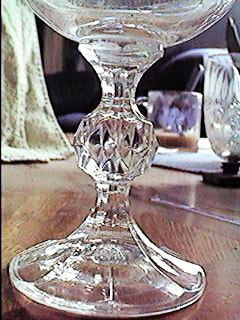 Cindy H. identifies this stem as Cascade by Import Associates as shown on p. 161 of Crystal Stemware ID Guide by Page & Frederiksen. 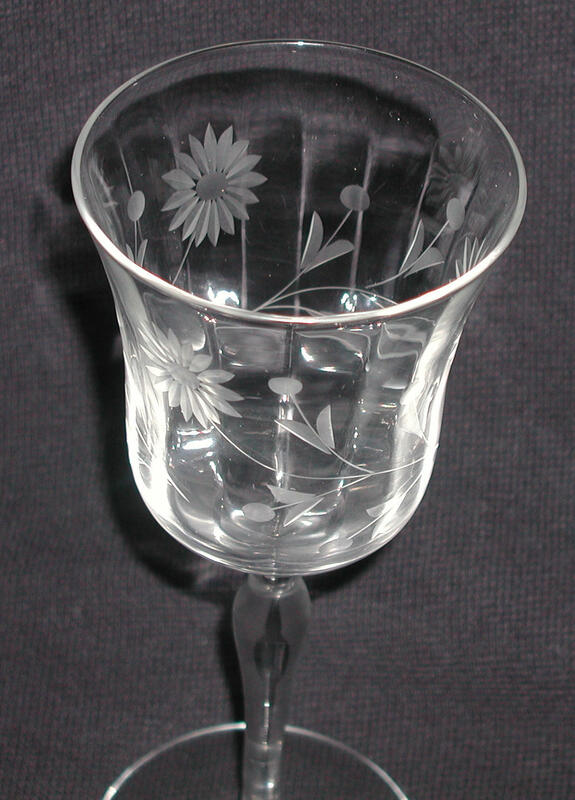 Lenore suggests that "the goblet could have been made by Bohemia Crystal as it has the same stem as their Queen's Lace pattern." "Rose" Etch Crystal: Next are Karen's three photos showing a "rose" etch, several pieces of stemware and a close-up of the stem. Mary R. identifies these stems as Libbey/Rock Sharpe #3003-10 whose design includes a white rose, crown and gold trim, citing a listing at Replacements Ltd.
Child's Tea Set: Roxanne, who says she remembers playing with this tea set about 1952, would like to find more information about it. 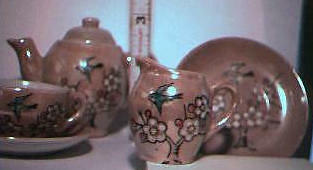 Marked "Little Duchess" and "Japan" on the bottom, the teapot is the tallest at 3 inches. The set appears to have a "lustre" finish and postdates the Occupied Japan era. Any ideas? Decanter Stopper: Lydia suspects this clear (not yellowed) decanter to be early to middle period American cut glass, possibly Bakewell. It is free blown with applied neck rings and foot; the two-part stopper has a hollow ball and applied neck. Cutting: strawberry diamond and punties within S-scroll, triangles of crosshatch, facet-cut neck rings, panel cut remaining area. 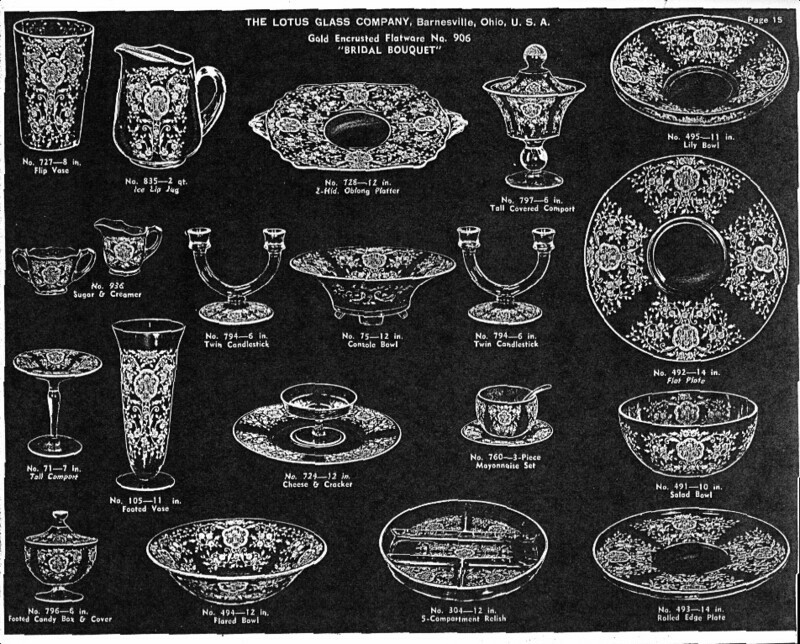 The S-scroll motif is like the 1840 lacy pressed glass "peacock feather" motif in the center of plates. Few specks of carbon and silica (? ), moderately thick, master workmanship. Wouldn't pressed design be an imitation of cut design and not vice versa? 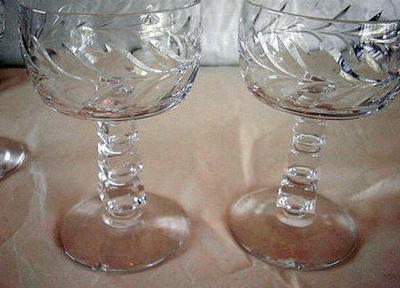 Clear Stemware: Debbie S. would like to ID these crystal stems for her sister, who inherited them from her husband's family. They are clear, but appear irridescent and have green bases. Tiffin La Fleure: Thanks to Helen Jones at Backward Glances for providing this image to identify the etch on my "mystery" stem. 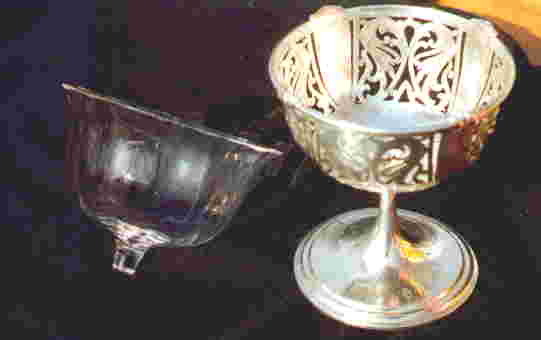 From the shape of the optic bowl, I had thought my cocktail to be Fostoria's #6007, but the Fostoria stem is faceted and the Tiffin stem is plain. Blue Bowl: The Yoshidas are trying to identify the etch and maker of this pedestal bowl. 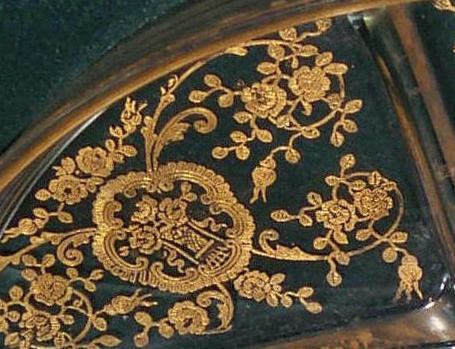 The motif includes a swan (see close-up view). Fruit Dish Insert: Glenn also would like to learn more about this 3.5" diameter insert for a 4" high fruit dish. Pitcher: Is this a Blenko pitcher? "T" has identified this pitcher as Blenko #9415 by contemporary designer Hank Adams, who worked for Blenko in 1988-1994. The color is violet with an amber handle. More Adams glassware.